If your ingrown toenail persists despite carrying out self care treatments, see Dr. B C Shah for advice. It is very important you visit Dr. B C Shah if you have diabetes and an ingrown toenail. Having diabetes could affect the healing of your toenail, particularly if your diabetes is poorly controlled. 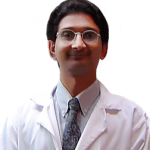 You should visit Dr. B C Shah if you have a persistent or severe ingrown toenail. An ingrown toenail can be caused by a number of different things. Badly cut toenails increase your risk of developing an ingrown toenail. Cutting your toenails too short, or cutting the edges, will encourage the surrounding skin to fold over your nail and the nail to re-grow into the skin. Wearing tight-fitting shoes, socks or tights places pressure on the skin around your toenail. If the skin is pressed onto the toenail, it may be pierced. Tight-fitting footwear can also cause your toenail to curve inwards towards your skin, resulting in an ingrown toenail. The skin on your foot can become moist and soft through excessive sweating or from poor foot hygiene, such as not changing your socks regularly. Having soft skin around your toenails makes it is easier for your nail to pierce the skin and embed itself within it. Injuring your toenail can sometimes cause an ingrown toenail to develop. For example, damage can occur if you stub your toe or if your nail is accidentally ripped off. Sometimes, a toenail can become thicker and wider if it has been affected by a fungal nail infection, such as athlete’s foot. If your toenail becomes brittle, pieces of nail may break off, making it easier for the nail to pierce the surrounding skin and for an ingrown toenail to develop. If you have naturally curved or fan-shaped toenails, your risk of developing an ingrown toenail is increased. This is because the sides of your nail are more likely to press into the nail fold (the skin surrounding the nail). If your ingrown toenail symptoms are mild, you can treat them using self-care measures. More severe cases may require surgery. If your toenail does not improve, Dr. B C Shah may recommend that part or all of your toenail is surgically removed. The procedure is carried out under local anaesthetic (painkilling medication), which is injected into the base of your toe. The edges of your toenail are cut away to make the toenail narrower and give your nail a straight edge. This makes it less likely to dig into the surrounding skin. After having nail surgery, your toe will be wrapped in a large sterile bandage. This will help stem any bleeding and prevent infection. You should rest your foot and keep it raised for 1-2 days after the operation. After the anaesthetic has worn off, your toe may be sore and tender. To help reduce any pain, you may need to take a painkiller, such as paracetamol, and wear soft shoes or open-toed sandals for the first few days following surgery. You can remove the bandage two days after having nail surgery. Soaking your toes with salt water will help the area heal. There are a number of things you can do to help keep your feet healthy and prevent problems developing. Your chances of developing an ingrown toenail are greatly reduced by cutting your nails properly. You should cut your toenails straight across, not at an angle or down the edges. You may find it easier to cut your toenails after having a bath or shower because they are likely to be softer. Maintaining good foot hygiene will help prevent problems developing with your feet. Keep your feet clean by washing them every day with soap and water. Dry your feet thoroughly and apply moisturising foot cream (not body lotion). Use a foot file or a pumice stone to remove hard skin on a regular basis. You should also change your socks (or tights) every day so that your feet remain as clean and fresh as possible. Wearing comfortable shoes that fit properly is also very important for ensuring that your feet remain healthy, and for avoiding problems such as ingrown toenails. If your shoes are too narrow or too tight, your toes can become overcrowded. Shoes that are too loose can put pressure on your toes when you walk. It is better to shop for shoes in the afternoon. During the day your feet swell, so if a pair of shoes fit in the afternoon when your feet are at their largest, it is more likely that they will be comfortable. You should visit Dr. B C Shah if you have problems with your feet. They will be able to examine your feet and give you advice about the right shoes to wear to help your condition.